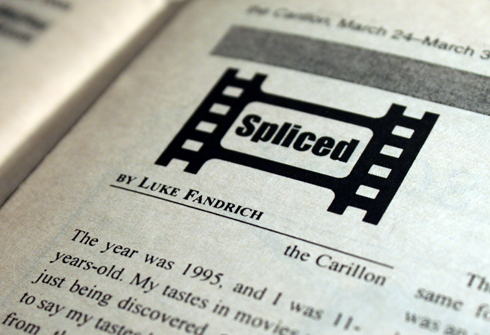 The following comes from my column, Spliced from Volume 47 - Issue 22 of the Carillon (the University of Regina newspaper) from March 2005. The year was 1995, and I was eleven years old. My tastes in movies were just being discovered, and needless to say they had not ventured far from the Teenage Mutant Ninja Turtles (1990) or Aladdin (1992). 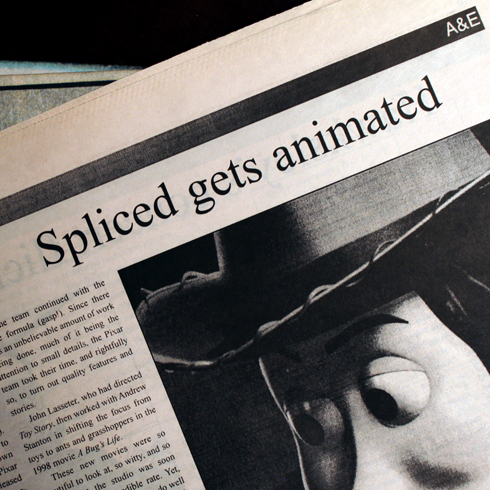 This of course was all about to change thanks to a little known company at the time called, Pixar Animation, who that year released the first feature length computer animated film known as Toy Story. I think we all know where this is heading, since chances are you’ve seen at least one of the six smash hit animations Pixar has released in it’s 10 year feature animation relationship with Disney. What’s exciting about computer animation, is not only the attention to detail and the mimicry of all of the subtleties that reality entails, but it’s a new art form and style of making movies that has really just taken off in our lifetimes. Surprisingly, or maybe not to some, George Lucas was responsible for the initial development of the company. Long story short, the small division that would become Pixar was in its infancy when it was sold. Had Lucas known how successful it would’ve been, or had it had a bigger purpose at the time, perhaps Lucas wouldn‘t have let it go. When Toy Story burst into theatres it came to gross nearly $192 million in the US alone. 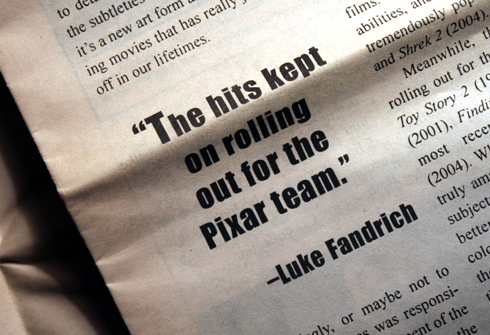 Clearly, the team at Pixar was on to something and their attention to detail and story was something that audiences were prepared to open their wallets for. The team continued with the same formula (gasp). Since there was an unbelievable amount of work being done, much of it being the attention to small details, the Pixar team took their time, and rightfully so, to turn out quality features and stories. John Lasseter, who had directed Toy Story, then worked with Andrew Stanton in shifting the focus from toys to ants and grasshoppers in the 1998 movie A Bug’s Life. These new movies were so beautiful to look at, so witty, and so genius that the studio was soon growing at an incredible rate. Yet, they never lost their focus for telling well thought out stories with an impressive standard of quality. Each time they pushed their skills further, and have now really become the masters of the computer animation market. Dreamworks was busy with it’s own animation department at this time, and had Pixar Animation not been so successful, it’s doubtful that Dreamworks would have worked so feverishly to develop competitive films. They’ve recently shown their abilities, and made history with the tremendously popular Shrek (2001) and Shrek 2 (2004). Meanwhile, the hits kept on rolling out for the Pixar team with Toy Story 2 (1999), Monsters, Inc. (2001), Finding Nemo (2003), and most recently The Incredibles (2004). What I find I can’t emphasize enough is that these are truly amazing movies about unique subjects and events that are only bettered by the vibrant cartoon colours and the physical depth that the computer animators create in these fictional worlds. Pixar Animation has slated Cars for 2006, and using the previous films as a guide I have a hunch that it’s going to be awesome. This film is also going to mark the completion of Pixar’s contractual bindings to Disney, but interestingly, Toy Story 3 has already been announced as a potential project. Only time will tell how that will unfold. Things are heating in the computer animation world, but it sure seems likes things are getting better and better.